Over a hundred invited guests packed into the centre to be the first to receive a copy of the book, which has been written by the Walkley Historians. The capacity audience comprised those who have been involved in the projects, whether as historians, oral history interviewees or providers of information. Walkley Historians comprise nearly 30 members of the community who have come together to work on the project. For some, it is the first time they have written a historical book. The lavishly illustrated book is the first history of 20th century Walkley. They also watched the world premiere of the documentary film ‘Who’s Living in a Slum?’ The film earned a round of applause during the end credits. It combines interviews, archive photos and oral history clips to tell the story of how Walkley was threatened with bulldozers during the 1960s and 1970s. 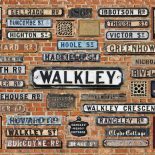 The documentary covers life in Walkley, the slum landlords, what it was like to live through slum clearance, the Walkley Action Group campaign to halt demolition and life in Walkley today. In three years the project has recorded over 65 oral history interviews, collected 1,000 private photographs for the online archive, conserved Walkley Reform Club’s First World War memorial stained-glass windows, put on exhibitions in local shops and cafes and marked out the lost streets of Ruskin Park. Copies of the book and DVD are available from Walkley Library, Beeches of Walkley and Gerry’s Bakery for a small donation to help fund reprints. This entry was posted on December 12, 2015 by Bill Bevan in Events, News, Uncategorized.